The Aesthetic Awards are one of the biggest nights in the Aesthetic industry’s calendar. 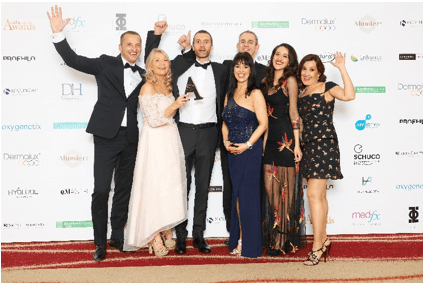 Hosted by Aesthetics Journal, the event brings together both clinics and companies to celebrate the best and brightest in the world of Aesthetics. Both the public and a panel of esteemed judges honoured Lumenis as the winners of The Best UK Subsidiary of a Global Manufacturer category. 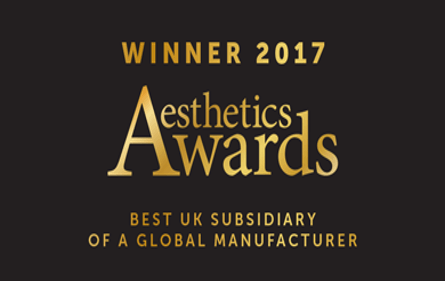 There are many UK Aesthetic device companies but what makes Lumenis an award winning company? At Lumenis we are driven by our commitment to improving the health and well-being of our patients and enabling our customers to provide the very best treatments with cutting-edge technology. With over 220 registered patents and numerous FDA clearances, an active install base of over 80,000 devices present in over 100 countries and a Lumenis device present in the majority of hospitals in the UK – when it comes to efficacy and safety in energy devices, you cannot beat over 50 years of experience and excellence. One of our core values at Lumenis is providing the highest quality of training possible – we want to ensure that anyone using a Lumenis system is fully confident and capable. Our training is free of charge when purchasing a system and we also provide core of knowledge, level 4 and level 6 training at Lumenis. We have a dedicated laser expert and CPD certified trainer who carriers this out for all Lumenis customers, free of charge. The most ongoing form of support our customers receive is of course from our service team; we have a service team of 7 engineers, 3 support staff and a service manager in the UK ensuring that we can offer quick response times and a flexible service to accommodate all customers. Having created solutions for previously untreatable conditions, Lumenis have set numerous technological and clinical gold standards. Our products range from hair removal with LightSheer, to skin rejuvenation with the M22 and the two most powerful CO2 lasers in the industry – AcuPulse and UltraPulse. The Lumenis R&D team work hard to keep introducing innovative new products to the market. For example SlimME which brought Lumenis into the body shaping market; FemTouch to address women’s health concerns; and our PiQo4 device coming out later this year. We take our social responsibility very seriously and continue to support charities such as the Katie Piper Foundation and Wound care for Heroes. We are committed to providing these life changing benefits for all who need it and promoting awareness of the treatments available for scars. Earlier this year we launched a new site – Hope for Scars dedicated to this cause.